Beoplay A1 is small enough to sit in the palm of your hand, it weighs only 600g and because of its shape (with no protruding buttons or legs) it is easy to store in your backpack or slip into a pocket. 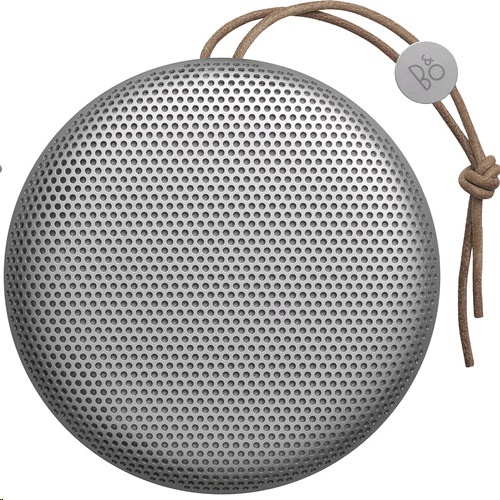 So you can take it anywhere you go and enjoy Bang & Olufsen Signature Sound when you get there. The rounded aluminium grill is both a thing of beauty and of strength, and together with the double-moulded polymer base, it forms a strong protective shell for the components within. Splash and dust resistant, Beoplay A1 is designed to take its fair share of bumps and scrapes while still protecting the delicate drivers and electronics inside. The more it travels with you, the more stories it can tell. Packing a punch well beyond its weight and size, A1 has ambient True360 sound – so the sound dispersion is great wherever you put it. And with a peak power of 2x140 W you won't have to huddle round it to enjoy your music. Because of the rimmed design around the base of the unit, the microphone gives uniform speech sensitivity 360º around the speaker. This makes voice recognition at the other end of the call much easier. Thanks to the microphone you'll also be able to activate Apple Siri and Google Now voice commands by simply pressing a button.